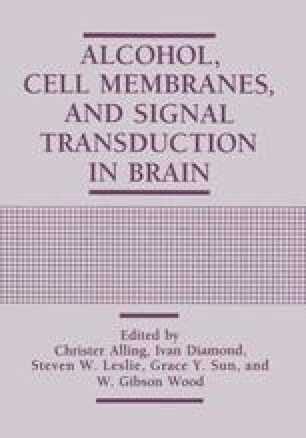 The cell-surface receptor activation of phospholipase C and the subsequent production of 1,4,5 trisphosphate and diacylglycerol and intracellular calcium mobilization is a key signal transduction system utilized by brain as well as many peripheral tissues (for review, see Fisher et al, 1992). The role of phospholipase C as a mediator of ethanol actions in brain has been the subject of several investigations (Gonzales et al, 1986; Hoffman et al, 1986; Smith et al, 1986). These studies focused on the activation of PLC by classical neurotransmitters such as norepinephrine histamine, and acetylcholine. However, very little information is available regarding the possible effects of chronic ethanol on neuropeptide -stimulated PLC and subsequent calcium mobilization in neural tissues. This laboratory has recently reported that chronic ethanol significantly reduced the stimulation of [3H] inositol phosphates production by bradykinin (Smith, 1991). In the present report, possible mechanisms for this down-regulated response were examined in N1E-115 neuroblastoma cells. Although neuroblastoma are transformed cells, they retain many neural properties (Bozou et al, 1986; Monck et al, 1990; Twombly et al, 1990; Milligan et al, 1990) and, therefore, represent a suitable model system to study alterations in signal transduction, thus avoiding the inherent complexity and heterogeneity of cell populations within brain tissues.